Return of the Enola Gay HAND SIGNED by Paul Tibbets! WWII! Atomic Bomb Pilot! rockymtntext has no other items for sale. Details about Return Of The Enola Gay by Tibbets, Paul W.
Return Of The Enola Gay by Tibbets, Paul W.
War's End: An Eyewitness Account of America's Last At... by Antonucci, Marion K.
Sales tax may apply when shipping to: CO*(7.9%), IA*, MN*, WA*. First rate first-hand re-telling of an event that changed human history. 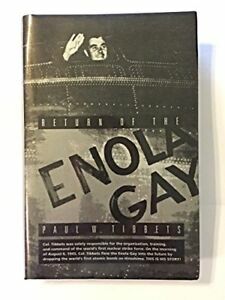 Written by Paul Tibbetts, as Colonel in command of the 509th Composite Group, he oversaw the total preparations and delivery of both atomic bombs used in World War II, piloting the lead mission plane 'Enola Gay' himself, that pushed the Japanese to finally surrender and end the vast global conflict. Tibbetts served in all theaters of World War II and eventual achieved Brigadier General rank in the USAF. His clarity of thought, command experiences, organizational aviation talent and first-hand involvement with delivery of the most powerful weapons devised by mankind, make this a unique and unparalleled military read. Should be required 'academy' reading. Great History book, should be part of the school reading program. Combination biography and historical account of events. Easy reading about his life and military. Outstanding first person account of history. The book is wonderful. It is historically accurate, very readable, and gives the reader a sense of "being there." Fascinating first person account of the historical event which brought to a sudden end the 2nd World War. Highly recommend. It should be a must read for all students of history.